If you can express in writing what it is like to grow up as a son or daughter of a law enforcement officer, you could be eligible to win a $2,000 college scholarship. Cops’ Kids, Inc. was created with one overall purpose in mind: to lend support to the children of active-duty sworn law enforcement officers. Our primary vehicle for achieving that purpose is providing scholarships to college-bound children of police officers. Applicants must be the son or daughter of an active-duty sworn law enforcement officer employed by either the Huntsville, Madison, Decatur or Athens Police Departments or the Madison or Morgan County Sheriff’s Offices. Applicants must have been accepted by and enrolled in a community college, junior college, college or university. The applicant can be a high school graduate starting on a college career or a student already enrolled in an institution of higher learning. Applicants must submit a written essay (maximum 2,000 words) that expresses that applicant’s experience growing up as a child of a law enforcement officer. That’s it. The scholarship is not based on grade point averages, social activities, finances or letters of recommendation. Basically, this is a creative writing competition. Each spring Cops’ Kids, Inc. will select what our judges believe is the best of the submitted essays and that student will be awarded a $2,000 scholarship. In July of 2019, the U.S. Space & Rocket Center will be celebrating the three-man Apollo crew’s successful moon landing. Cops’ Kids is very pleased to be sending our own Team to Space Camp during the 50th Anniversary Week of July 14 – 19. Our three team members (all children of active duty police officers), LEILA, JASON & MEGAN, each won a full week’s tuition after writing to us and explaining why they would be good candidates for Space Camp. 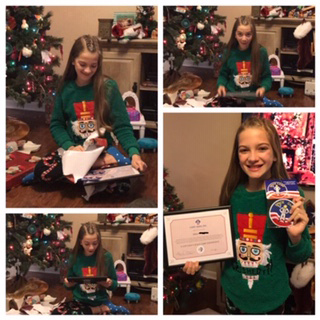 Below are photos Leila’s parents sent to us of their daughter discovering she was headed to Camp when she unwrapped her certificate on Christmas morning. We offer support to the children of active-duty sworn law enforcement officers by providing scholarships to the officers’ college-bound sons and daughters. Applicants may submit their essays between January 1st and March 31st. (Any essays submitted outside of these dates will not be considered.) Submissions may be made through this website. 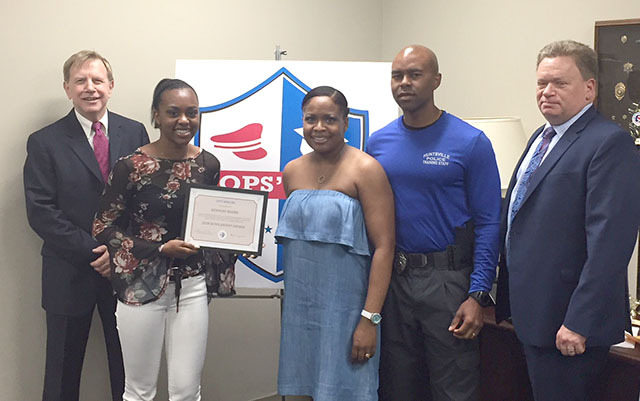 Funds donated to Cops’ Kids provide scholarships to students in the Huntsville and surrounding communities. Read more to find out how you can contribute.